WWE’s Elimination Chamber pay-per-view ended up being a very newsworthy event. Not only were the WWE Women’s Tag Team Titles determined, but there were title changes all night until Ronda Rousey broke that streak. Then Becky Lynch busted Rousey’s head open with a crutch. Kofi Kingston also elevated his career to another level with his performance in the main event match. The main event was the men’s Elimination Chamber for the WWE Title. Daniel Bryan defended his title against five other men in Samoa Joe, Kofi Kingston, Randy Orton, AJ Styles, and Jeff Hardy. It all came down to Daniel Bryan and Kofi Kingston. Randy Orton was on a roll after defeating AJ Styles with an RKO, but Kingston caught Randy with a Trouble In Paradise to surprise everyone with a pin fall on The Viper. Bryan and Kofi went hard on each other from the second they were alone in the Chamber together. Kingston did not back down one bit and the crowd was fully behind him. Bryan continued his assault on Kofi with a melee of kicks and dropkicks, but Kofi wouldn’t give up. Kingston came back with a double knees to the chest for another close two count and the crowd erupted into “Kofi” chants. Bryan rolled out of the ring and Kofi followed him. Kingston wailed on the WWE Champion outside of the ring and then Kofi tried a bulldog. Daniel Bryan reversed Kofi’s maneuver and drove Kingston into a chamber pod. The New Day member still kicked out of a pi after taking a running knee and the crowd lost it. 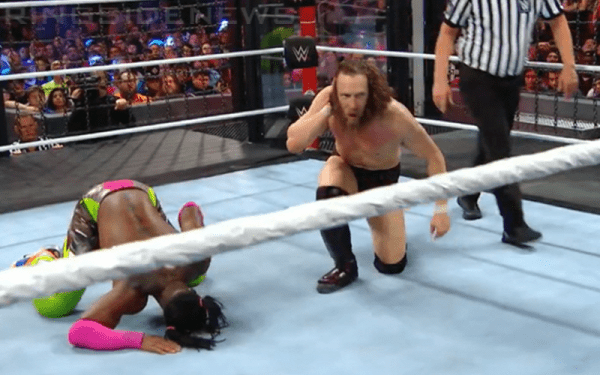 Suddenly, Kofi nailed Bryan with a Trouble In Paradise for a two count and Bryan soon had Kofi in the LeBell Lock, but Kofi fought to get out of the hold and got to the ropes causing Daniel to release the submission. They both climbed up to the top of a pod and started fighting for position. Kofi tried for a suplex, but Bryan blocked it. Daniel bounced Kofi’s head off of the glass and tried to suplex Kingston off of the pod, but Bryan was blocked again and he climbed down to the top turnbuckle. Suddenly, Kofi kicked Bryan down and he missed a very high splash off of the top. Bryan psyched himself up and hit a running knee to win the match. After it was all said and done, Kofi Kingston did not win the WWE Title. However, as he spoke about the even after the match he disclosed the overwhelming wave of support the WWE Universe sent him. Later on, after Kingston had a chance to let it all soak in, he sent out another thank you to the WWE Universe for supporting him. The twelve-year WWE veteran has seen a lot of highs and lows in his career, but nothing compared to the Elimination Chamber. Perhaps WWE is setting the stage for a monumental Kofi Kingston push. The WWE Universe could very well demand it after his performance in Houston.